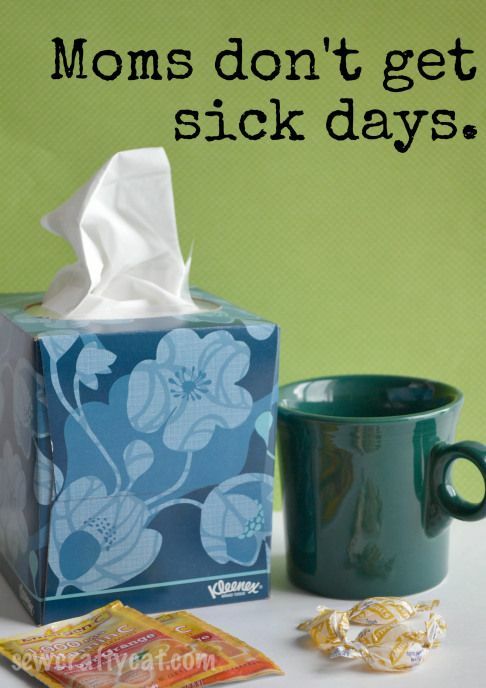 As a single parent for most of my parenting life (even when I was married, I never had anyone to co-parent with me) I have always lived by the motto that parents don’t get sick days. I remember once when my oldest son was little, probably 3 or 4, my cousin was spending some time with us. I was sick with the flu a couple of days and while there were people around who could have (and willingly would have) helped my son, he wanted his mom. And no matter how sick I felt, I took care of him. I did whatever he needed from me, between trips to the bathroom. My cousin just shook her head, amazed. She tried to convince my son that she could help him, but he wanted mommy. I fear we may have scarred her for life – she still doesn’t have kids. Recently, my ex-husband texted me on a Wednesday that he was going to be too sick to see his son that upcoming Friday. He sees his son for about 24 hours every other weekend. My son, at the wise old age of 10, looked at me and said, “How does he know he will be sick on Friday, it’s only Wednesday?” I held in my snarky comments and told him to tell his dad he hoped he would be feeling better soon. Then I put it into comparison. I have been having debilitating back pain this fall, but I’m still a mom. One night before going to bed I was having a severe flare up of back pain and had taken all of the ibuprofen I was allowed for that day and took something stronger to help me sleep. Eventually, I fell asleep, from about midnight until 3:00 AM. At 3:00, it was too soon to take the powerful meds again, but it was a new day so I started on the ibuprofen again. It didn’t touch the pain. It hurt to sit. It hurt to stand. It hurt to lie down. So as 3:30 AM I gave up trying to rest and I got everything ready for my day. I called out sick to work. I checked the absentee list for the day and arranged coverage for an unfilled teacher. I emailed my secretary the plan for coverage. I emailed my assistant principal anything he needed to cover for the day. I emailed my superintendent to let him know I would be out. I packed my son’s lunch. And I waited until it was time, then I woke him up, made him breakfast, got him ready for school and waved goodbye when he left for the bus. Then I drove myself to the emergency room. And I made it home in time to greet my son when he got off the bus. This mom definitely doesn’t take a sick day.